At least one in three women and girls will be subjected to violence and abuse in their lifetimes– that’s more than one billion lives destroyed by trauma and injury. It all starts with us, so don’t look away. Don’t stop the conversation. To me, there is no greater injustice than violence against women and girls. That’s why, as UN Women’s Goodwill Ambassador, I have spoken most on this issue. As an actress and activist, I can raise my voice and help raise awareness. As a neighbour and friend, I can intervene when I see abuse happening. As a mother, I can teach my children to value and respect themselves and others. I can teach them not to condone or accept discrimination and violence against women and girls. To make violence against women and girls an issue of the past, we have to start with the generations of today and the future. Starting from 25 November, the International Day for the Elimination of Violence against Women, to 10 December, International Human Rights Day, activists around the world will be taking action, raising their voices against gender-based violence (#16days). They will use the colour orange visibly and creatively to make it impossible for anyone to ignore the issue anymore. Take part in it. Orange YOUR neighborhood to raise awareness (#orangeurhood). Reach out to your neighbours, local stores, schools, libraries and post offices. 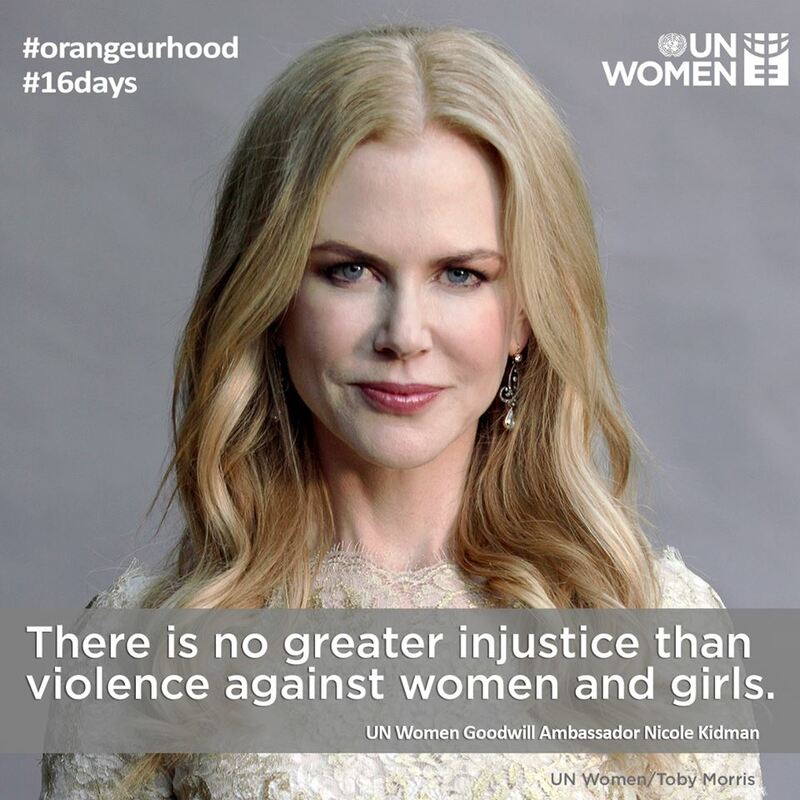 This entry was posted in Inspirational, Mother, Wife, Women and tagged #16days, #orangeurhood, herstory, humanitarian, inspiration, Inspired by my mom, inspiring story, Mother, Nicole Kidman, one in three, UN Goodwill Embassador, Violence against women, Woman. Bookmark the permalink.